The Lunar Module known as Spider is in lunar landing configuration. 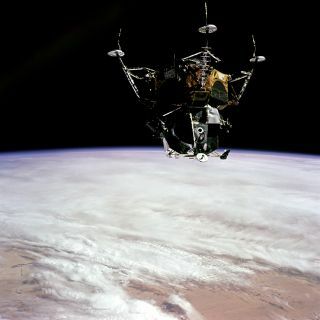 In this historical photo from the U.S. space agency, a view of the Apollo 9 Lunar Module "Spider" in a lunar landing configuration photographed by Command Module pilot David Scott inside the Command/Service Module "Gumdrop" on the fifth day of the Apollo 9 earth-orbital mission on Mar. 7, 1969. The landing gear on "Spider" has been deployed. lunar surface probes (sensors) extend out from the landing gear foot pads. Inside the "Spider" were astronauts James A. McDivitt, Apollo 9 Commander; and Russell L. Schweickart, Lunar Module pilot.